Thick, meaty Bolognese sauce makes these Stuffed Eggplant Boats a hearty, satisfying meal – easy enough for a busy weeknight and fancy enough for company. When I was six years old, Mrs Obinger from across the street taught me how to measure salt in the palm of my hand. First, she showed me a teaspoon and let me practice a little. Then we moved on to half-teaspoons, and finally quarter-teaspoons. (Cooking and teaching fractions go together so nicely, don’t you think?) It didn’t take long before I was a palm-measuring pro. “See there, dear, now you’ll never need a measuring spoon again!” I remember Mrs Obinger telling me. Then we made a batch of her wonderful coconut cookies. I’ve been measuring in my palm and guestimating amounts ever since. The problem about being a “Pinch & Toss” kind of cook is, on those days when you hit it out of the park and make something amazing – something you want to make again and again – and possibly even Share – sometimes it’s difficult to remember just exactly what went into it in the first place, and how much, and when, and at what temperature, for how long… anyway, you get the idea. I solve this problem with my phone’s voice recorder app. I just hit record whenever I’m feeling a little culinary inspiration; and while I erased far more recipes than I keep, the habit is starting to pay off. This recipe for Bolognese Stuffed Eggplant Boats is the first one for which my new “recipe recording” system proved its worth. I would have been hard pressed to make it a second time if I hadn’t recorded myself while I was making it. It’s a real keeper, too! Thick, meaty bolognese sauce makes these Bolognese Stuffed Eggplant Boats a hearty, deeply satisfying meal without being heavy or weighing you down. 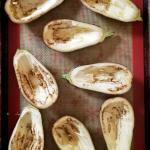 Slice each eggplant in half, lengthwise from stem to blossom end. 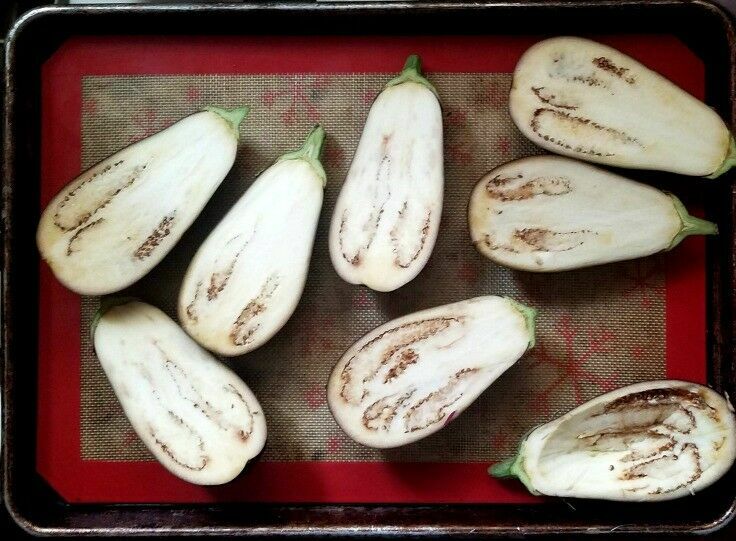 Using a spoon, hollow out eggplants, leaving about a 1/2-inch-thick border around skin to create a boat. Line a heavy baking sheet with foil, parchment paper, or a silicone mat. Set aside the scooped-out eggplant for us in the filling. Transfer eggplant boats to transfer to prepared baking sheet. In a large skillet over medium-high heat, sauté chopped onions and mushrooms in 2 teaspoons olive oil until they are soft and the onions are translucent. Reduce heat to medium. Add minced garlic and chopped eggplant from the Eggplant Prep and cook, stirring frequently, until eggplant is almost fully cooked. Push eggplant mixture to the sides of skillet and add the mild Italian sausage to the center. Cook sausage, breaking up as you go, until it is fully cooked. Reduce heat to medium-low. Add Kosher salt, dried basil and oregano, pepper, hot sauce (optional) and diced tomatoes. Bring mixture to a simmer and cook, stirring occasionally, until mixture has reduced and no watery liquid remains in the pan when you pull the mixture away. Remove skillet from heat. To the mixture in skillet, add ½ cup bread crumbs and 2 ounces of grated Romano cheese. Give it one good stir to incorporate everything together. 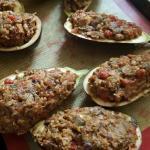 Using a large spoon, evenly divide the filling between the eggplant halves. Bake uncovered for 30-35 minutes. 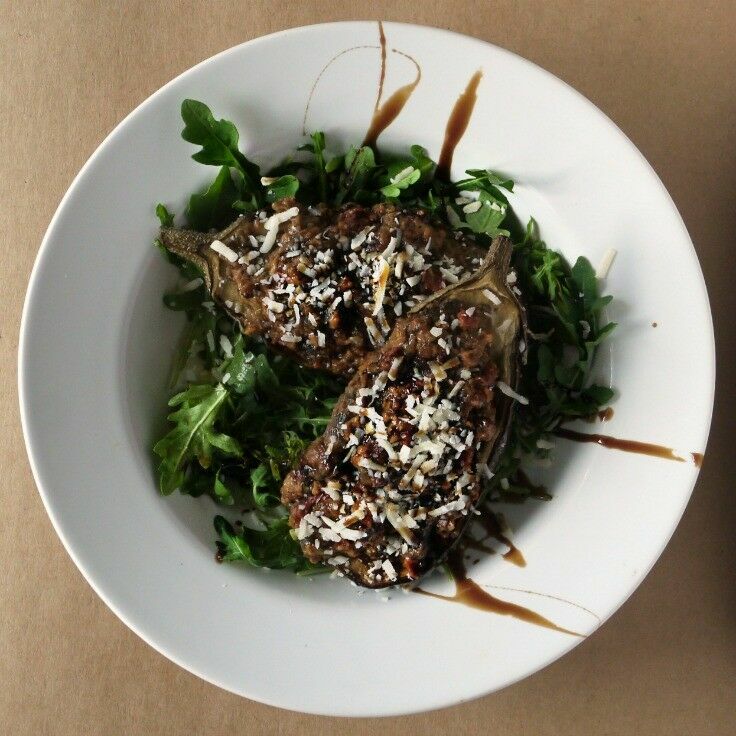 Serve on a bed of baby arugula. 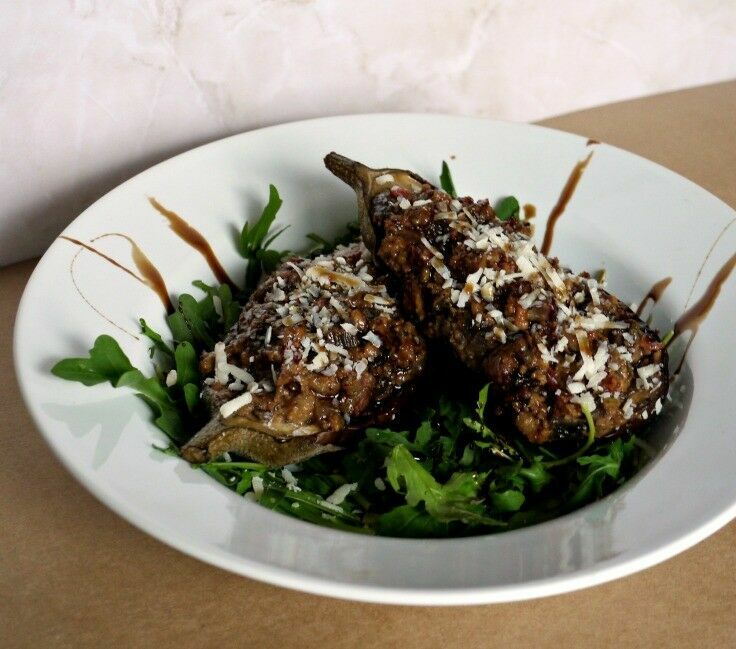 Finish with a generous drizzle of balsamic glaze and a sprinkling of Romano. Mix balsamic vinegar and brown sugar a small saucepan over medium heat. Heat until the mixture begins to boil. Reduce heat to medium-low. Simmer, stirring occasionally, until mixture has reduced by half; 10-12 minutes. Remove from the heat and set aside to cool. 1 whole eggplant with stuffing = 7 pts. You can easily make this a vegetarian meal by substituting a plant-based protein for the Italian sausage. Bolognese Stuffed Eggplant Boats can be prepared up to two days ahead of time and thrown in the oven when you are ready to eat. Be sure to add five to seven minutes to the cooking time if you put them into the oven cold from the fridge. 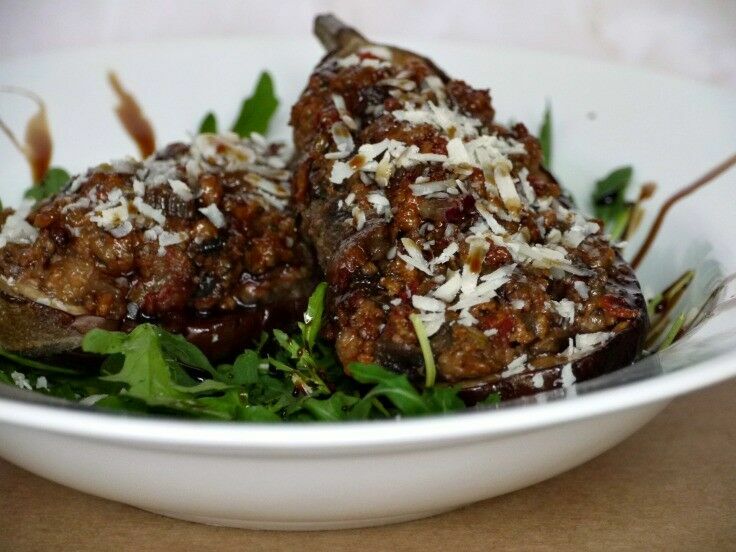 Always looking for new eggplant recipes and this stuffed ones looks wonderful. Reminds me of stuffed green peppers. Ummm… yum! These sound so good! 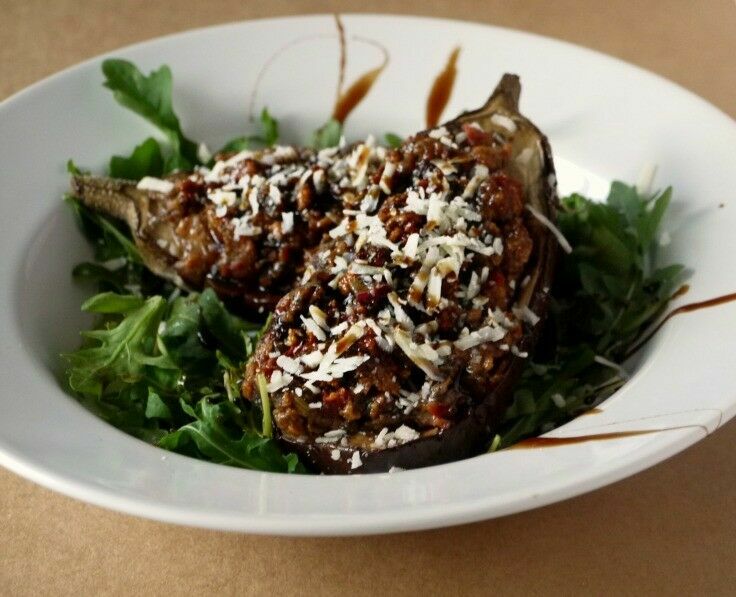 I love a good eggplant boat and I would have never thought to put a balsamic glaze on top!! Yummy! I love eggplant! These look and sound so good! These look amazing! Like you said, easy enough for a week night dinner or fancy enough for company! I will definitely be making these. Something different to add to my menu! I really enjoy eggplant, but I’ve only ever really had it in eggplant parmigiana, so this looks like a fun and good recipe to have it another way! This looks really tasty. I know my mother would really love this. Yum! 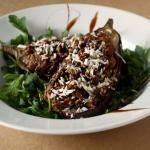 I don’t think I’ve ever seen stuffed eggplant before and your version sounds SO amazing!!! I’m now dreaming up all the possibilities of stuffing this yummy veggie! This sounds so amazing!! Perfect for our next date night in!! Thanks a bunch! I haven’t had eggplant in ages and you’ve inspired me to make some! This looks delicious! And so helpful that you’ve included WW points! Thank you! If you make it, be sure to come back and comment again! Yum! 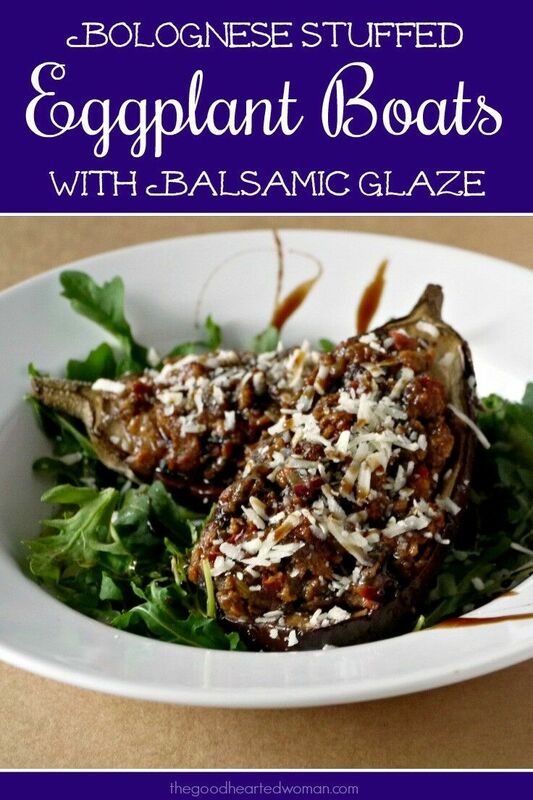 This is such a fun new way to use eggplant! I’ve just recently convinced the fella that eggplant is delicious, so this would be a really fun recipe to try next! I love how you learned to measure salt! Also, what a great tip on the phone recorder!! Can’t wait to try this eggplant! Yum!! These sounds delicious! I’ve only ever made zucchini boats, and never thought about eggplants! Such a smart and unique idea! I love how this looks and tastes really fancy, but isn’t all that complicated to put together – delish! These are beautiful! 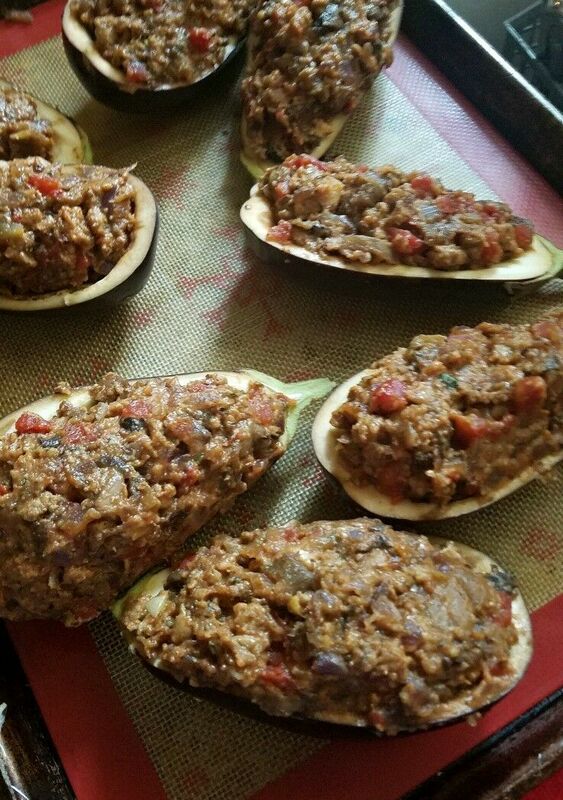 I’ve never stuffed eggplant before…. totally looking forward to trying this out! My goodness this looks so comforting and delicious! Love the tip about the voice recorder app too. Need to try that myself. Any recipe with eggplant always peaks my interests. It’s one of my favorites. I like the idea of stuffing it full of bolognese for that rich flavor.